When you think of arthritis you probably think of old dogs. But the truth is, arthritis doesn’t just affect old dogs. It’s estimated that one in five dogs will show signs of arthritis by the time they’re one, and that number increases to 80% by the time they’re eight. So unfortunately most of our dogs will experience arthritis during their lifetime. That doesn’t mean they can’t play or exercise anymore, in fact keeping your arthritic dog fit is the most important part of keeping them comfortable. While it may seem counter intuitive to exercise a dog with arthritis it’s an important part of keeping them mobile. The trick is finding what exercise works well for your dog. Regular low impact exercise will help them maintain muscle, reduce stiffness and improve flexibility. Dogs with arthritis also need to maintain a healthy weight. Any extra weight adds more pressure and pain to your dogs achy joints, and that makes getting regular exercise more of a challenge. Unfortunately there isn’t a cure for arthritis, but there are ways to manage it and keep your dog fit. 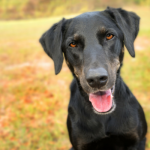 In this article we’ll go over some ways to help keep your arthritic dog fit and healthy. 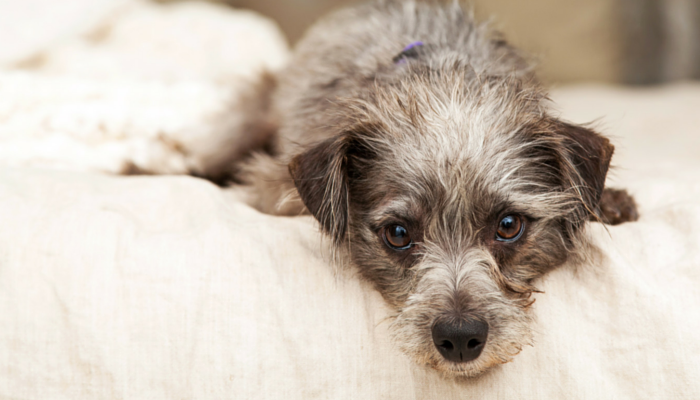 Here’s 10 tips to help keep your arthritic dog comfortable. While this may seem like a no brainer you’d be surprised at the amount of self diagnosing that goes on when it comes to our pets. 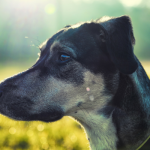 If your dog is limping or getting stiff it’s normal to assume it may be arthritis, but it’s important to get the correct diagnosis from a professional. There are a lot of conditions that cause stiffness & limping, and each of them requires a different management plan. The exercises that are recommended for arthritis can cause more problems for a dog with an ACL inury. My dog was showing signs of arthritis long before she got the official diagnosis. Since it’s a progressive disease it’s easy to write off a little stiffness now and then as just normal aging. It’s not something that just suddenly appears one day, and it’s not always easy to notice the subtle changes. It’s not just arthritis that can cause limping & lameness, there are many conditions that have similar symptoms. Consult your veterinarian if your dog is showing any signs of lameness, pain, limping, jumping or difficulty getting up. Your veterinarian will be able to rule out any injuries or other conditions that may be contributing to your dogs discomfort. When my dog Laika began showing signs of lameness we took her in for a checkup. Because she’s a German Shepherd mix our veterinarian ruled out a couple of genetic disorders & diseases such as hip dysplasia & degenerative myelopathy before making the official diagnosis of arthritis. Because arthritis symptoms mimic those of many other conditions it’s not always easy to diagnose right away. Your veterinarian will do a physical examination, often including a neurological assessment to rule out other joint problems. They may do a series of blood tests and run x-rays. Your dogs age, breed and complete history will be taken into consideration. Managing arthritis includes maintaining a healthy weight, staying fit with low impact exercises and managing pain. That regimen can make other conditions worse, so it’s important to consult your veterinarian for the right diagnosis before you start any treatment plan. Once your dog is diagnosed with arthritis your veterinarian will be able to help you come up with a management plan that’s right for your dog. Arthritis symptoms mimic those of many other conditions. Consult your veterinarian for the correct diagnosis and to come up with a management plan that’s right for your dog. When it comes to keeping your arthritic dog comfortable you’re going to need to start keeping track of how much exercise is too much. After my dog over exerts herself she gets stiff in her hind legs, most notably in the evening. For months I kept notes detailing what activities Laika did throughout the day. I wrote out what exercises we did, for how long, and whether or not she showed any signs of stiffness or limping at the end of the day. I did this with a pen and paper because I’m old school. I assume you’re more digitally advanced than me and can track your activities on your phone. Whether you keep track with a pen & paper or do it on your phone doesn’t matter – the important thing is keeping track of how your dog does after each activity. 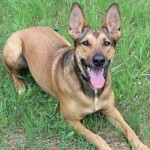 Every dog is different, and the amount of exercise each dog needs will vary. Being fairly young Laika still does well with an hour of low impact exercise each day (walking & swimming mostly), but that amount can vary from day to day. Keep track of what exercises make your dogs lameness worse, and which ones don’t present any symptoms later on. If your dog can walk for 30 minutes with no problem try 35 the next day. A big part of managing your dogs arthritis will be figuring out what exercises they can do and for how long. And remember that arthritis is progressive, so what works for your dog today might not work a year from now. You’ll have to keep taking notes on what works & what doesn’t, and adjust accordingly. When your dog has arthritis they’re going to need some extra rest between physical activities. The best way to keep your dog busy & entertained is by giving them something mentally challenging to do. These are great activities because they not only keep your dog entertained, but they’ll also give him plenty of mental exercise. And if you have more than one dog in the home these activities are great for everyone, regardless of whether or not they have arthritis. All dogs benefit from more mental stimulation and fun. If your dog is pretty active these games can be life savers. It’s heart breaking when your arthritic dog still wants to GO, GO, GO, but at least you can help break up their day with something fun that helps give them a routine and purpose. If your dog has arthritis they’re going to need more than just physical exercise to keep them busy. Coming up with some fun indoor activities for your dog will help keep them mentally stimulated. 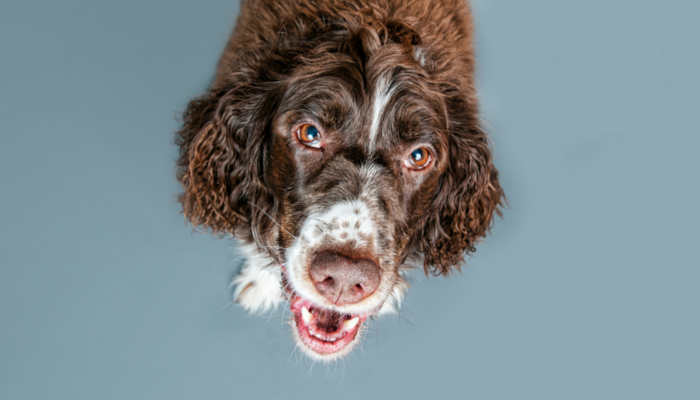 You’re going to have to learn to play bad cop, at least when it comes to your dogs exercise. You’re the one who has to say “enough is enough,” even though your dog is still having fun. For my dog Laika this is my least favorite part of managing arthritis. She falls into the “still has a lot of damn energy” category, despite the arthritis. She’d gladly go running with me in the morning, play frisbee with me at noon, and be ready to run again immediately afterwards. Unfortunately she can’t. Dogs don’t necessarily call attention to the fact that they’re in pain, in fact many of them do a good job at suppressing signs of pain. So it’s up to you to watch out for any subtle signs that your dog is in pain, and often times they can be quite subtle. If you’re not sure how much exercise causes discomfort in your dog I suggest keeping notes. For the first year after Laika’s diagnosis I kept a log with what activities we did and for how long. I’d take notes on the nights where she was limping more than normal or showed any extra signs of lameness. 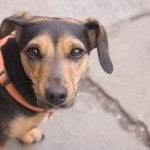 For your dog those outward signs of pain might not be as obvious as limping. Keep track of any changes in their routine. Are they not getting up as often as they normally do? Do they seem disinterested in normal activities? Do they seem grumpier than normal? Are they not interested in getting up on the couch like usual? Eventually you’ll begin to see a pattern of what works & what doesn’t for your dog. For us an hour of walking & some swimming later on is fine; but if that walk is paired with a game of fetch it’s not. Keep track of how long your daily dog walk is, taking notes of any extra arthritis symptoms afterwards. Once you know how long your dog can walk comfortably you can start trying to pair it with some other low impact exercises. When I overdo it with my dog Laika I feel terrible, but unfortunately it happens. It’s part of dealing with a progressive disease. The key is to keep track of what causes that extra pain, and finding ways to avoid it the next time. If we overdo it on Monday we’ll take it easier on Tuesday with more rest & indoor games. For many arthritic dogs getting up can be painful, and this is especially true for jumping up onto the couch or bed. You can make your own dog ramp or small step so they don’t have to jump. If you’re handy there are plenty of DIY dog ramps you can build to fit your needs. If you’re not a fan of using a ramp you can make a simple DIY sling our of a tote bag to help them get around. I didn’t have any extra tote bag around so I use a towel and use it to help support my dog as she jumps up onto the couch. I thought my dog would look at me like I was insane the first time I tried to wrap a towel around her midsection – but she didn’t. She was completely comfortable with it after two tries. Now I just have to say “want a lift?” and she’ll gladly let me put that towel under her belly to help lift her up onto the couch. Getting into the car can be a challenge for arthritic dogs. Make it easier on them by using a ramp, carrying them, or helping them with a sling. Raised food bowls are a great option for arthritic dogs since it prevents them from having to bend down every time they eat or drink. 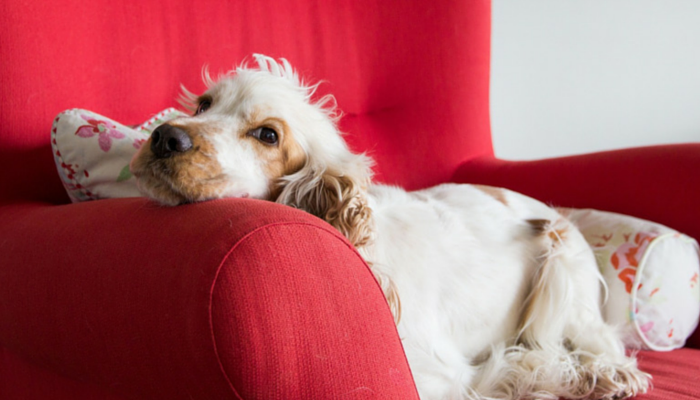 Provide your dog with a comfortable place to rest that has lots of support. Orthopedic pet beds are perfect for arthritic dogs since they help support their achy joints. Keep your dogs bed in a warm place. 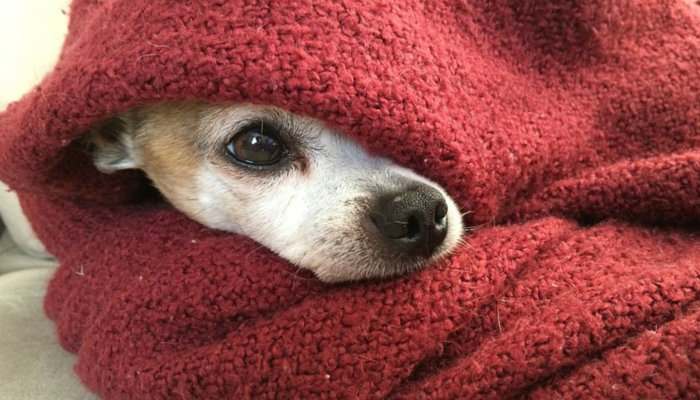 A little extra warmth can make your dog more comfortable. If you have hardwood or tile floors consider putting in some non-skid runners in spots that your dog frequents. 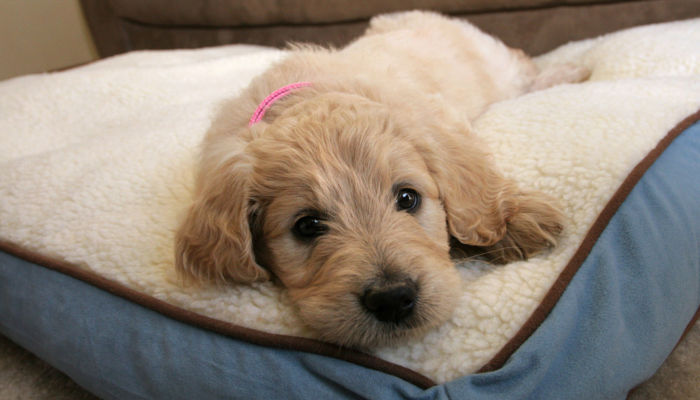 To keep your dog comfortable choose an orthopedic dog bed that offers extra support. Just a few extra pounds can make a big difference in our pets health, and currently over half of the dogs in the U.S. are overweight. Extra weight is especially harmful to dogs with joint problems such as arthritis, since that added weight makes the pain and inflammation worse. Extra weight places extra pressure on their joints and makes it more difficult for them to stay mobile and get proper exercise. Keeping your dog trim will help ease their arthritis pain. Keep your arthritic dog fit by sticking to a regular low impact exercise routine and cutting calories if needed. Whether you’re looking at prescription medications or natural options there’s hundreds to choose from. The problem is not every medication is right for every dog. And the list goes on & on. With so many options it’s imperative that you consult your veterinarian to find out what options may be right for your dog. The only supplement I can personally recommend for treating dogs with canine arthritis is glucosamine. It doesn’t come with a big list of negative side effects, and it’s regarded as a highly safe treatment. It helps lubricate joints and maintain healthy cartilage. But keep in mind these supplements may show decreased improvements over time. Any other medications or supplements should be discussed with your veterinarian. Ask your veterinarian about the different options. Tell them what your concerns are, and give them a full history of your dogs symptoms. They can help you come up with a pain management plan that’s right for your dog. There are hundreds of arthritis medications & supplements available. Consult your veterinarian to help determine what treatment options are right for your dog. You can help keep your dog comfortably by making sure their nails are trimmed. Long nails effect the way your dog gets around, and they can cause extra pressure and pain in their joints. Your dogs toes have receptors that provide your dog with information in relation to their position relative to the ground. When the nails are long enough to touch the ground it changes that information & perception, and your dog will adjust accordingly. The adjustments and weight shifting caused by long nails can lead to pour posture and an altered gait. And long nails cause your dogs legs to align differently, which can cause extra tension and pain in their joints. Here’s a great video by Dr. Leslie Woodcock that helps explain why trimming your dogs nails is so important. Massages are awesome, and for arthritic dogs they’re extremely beneficial. Massages can help promote a better range of motion in your dogs joints, and they can relieve stiffness. If your dog isn’t used to getting massages start slowly. Be gentle and slow, making sure they’re comfortable before moving onto their achy joints. Laika really loves the kneading motion on her rear legs, but it took awhile for her to relax and trust me enough to do all these crazy hand motions. Be patient if your dog isn’t totally into your massages right away. Keep it positive and gentle, and eventually they’ll come around and see just how awesome they are. Heat is another pain reliever for arthritis. One of the easiest ways I’ve found to keep Laika comfortable at night is by using heating pads. Most modern heating pads are designed to shut off automatically and keep from getting too hot. But just in case be sure to try it out a few times before leaving it on your dog. To get Laika used to the heating pad I’d set it to low and put it on her side while she was on the couch with me. I told her “good girl” and after a few second she stopped looking at that weird heat machine on her side and went back to resting. Over time I gradually increased her exposure to it, and was eventually able to set it to “high.” Now she loves it. When I get it out she comes running. Every evening she gets a little “heat therapy” with it, and it often puts her right to sleep for the night. Massages & heat therapy are simple ways to help keep your arthritic dog comfortable. If your dog needs to lose a few pounds measuring their food is one of the easiest ways to stay consistent. Cut out all those extra treats and stick to your regular dog food only. An extra fourth of a cup may not look like a lot, but over time it really adds up. If you normally eyeball their meals pick up a measuring cup next time you’re at the store. One of the easiest ways to help a dog lose weight is to start decreasing their portion size. Use a measuring cup to precisely determine the amount of food they’re getting, and keep track of their weight. Maintaining a healthy weight will help keep your arthritic dog comfortable, but it’s also important to your dogs health overall. Obesity can lead to many other healthy related issues. A 2007 study found that dogs who ate 25% less had an increase in their median lifespan of 2 years and showed a delay in onset of of chronic diseases. 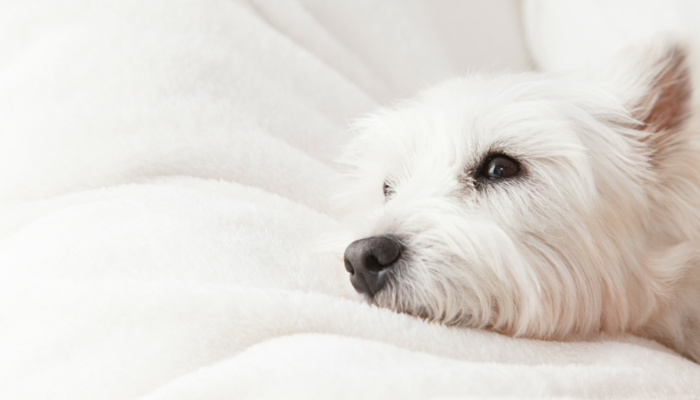 How Do You Help Keep Your Arthritic Dog Comfortable? How do you keep your arthritic dog comfortable? Do you have your own doggie ramp? Do you use a raised food bowl? Have you seen an improvement by using glucosamine supplements? He is heading to the vet in August and I intend on speaking to her about Adequan injections. I think you have to continually shift things up, because as you said, over time some of the treatments can become less effective. It’s so stressful to watch a dog go through arthritis! Thanks for the list of ways to make their lives more comfortable. I lost a dog to the side effects of Previcox, a commonly prescribed NSAID, after my vet prescribed it to my dog for her arthritis without warning me that death was a side effect. It doesn’t even take too many doses to kill a dog. I encourage ALL pet owners to do a google search of the side effects of ALL drugs their vet prescribes before giving them to their pets. When I did, I was horrified to find that NSAID’s (anti-inflammatories) have killed thousands of dogs, but your vet will never tell you that. As a matter of fact, when I’ve told several vets I do not want my dogs ever given any NSAID of any kind for anything after one killed my dog, they don’t care at all and instead, tell me how wonderful some of their patients are doing on it. There are safe alternatives out there, you just have to do some homework and for natural remedies, some trial and error probably. MY dog has been taking CBD oil and supplements as I am also against giving her NSAID and she is doing great. What supplements and what strength of CBD and how often? Fly, a Border Collie, has battled arthritis since I got her when she was seven years old. She has now gained herself a set of dog wheels so she can still enjoy getting out and about, including to her favourite places such as the beach! Canine Arthritis Management has provided great advice, with guidance on medication, supplements, and changes to the home and lifestyle. I wish they had been around at the start, as there are so many options available to make an arthritic dog’s life easier.